Britain's Adam Yates remains 14 seconds behind leader Miguel Angel Lopez with a stage to go at the Volta a Catalunya. The 26-year-old, who claimed victory in stage three, finished in 14th place in Saturday's 169km route. 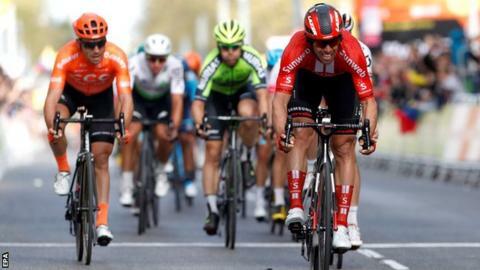 Australian Michael Matthews pipped Phil Bauhaus by a tyre's width to win the stage as the top five retained their overall positions. Sunday's final 143km stage starts and ends in Barcelona with the greatest climb up the 485m Creu d'Ordal. 3. Daryl Impey (SA/Mitchelton-Scott) "
4. Patrick Bevin (NZ/CCC Team) "
5. Mikel Aristi Gardoki (Spa/Euskadi Basque Country-Murias) "